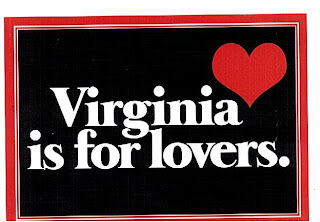 If Virginia is for lovers, why am I here without you? Oh, I remember. Because you didn't need to come and suffer through a logistics forum. I got it. Anyway, thank you for taking the time to do all those chores around the house while I'm gone. I am a proud and lucky lady to have such a helpful and handy hubby. It's wonderful to know the house isn't a complete disaster zone... (don't think I didn't hear your, "Now I can be messy!" comment before I left, butthead) and the dogs aren't running a muck down Ridgemont Drive.